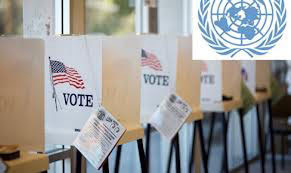 Salvation And Survival: U.S. Voter Fraud and the U.N.
U.S. Voter Fraud and the U.N.
With the stakes so high in this 2012 election, any informed citizen has got to be concerned about voter fraud. Who can forget the endless vote recounts in the 2000 Bush/Gore election? Then there was the contested and heated 2008 Senate race in Minnesota between Republican candidate Norm Coleman and Democrat Al Franken. I don't want to bore you with statistics, but the numbers tell a compelling story. On the morning after that election, with over 2.9 million votes counted, Coleman led Franken by 725 votes. Of course, with the results that close, lawyers for Franken descended; multiple recounts were done and eight months later, Franken was declared the winner by 312 votes. It was only natural that questions were raised, and a conservative group called Minnesota Majority started looking into the possibility of voter fraud. What they turned up was 1,099 felons who voted in the contested election. That's 1,099 ineligible voters. Minnesota Majority took their findings to different lawyers; all uninterested in pursuing their claims. However, Minnesota law requires that such voting irregularities be investigated. To date, 243 people have either been convicted of voter fraud or are awaiting trial --- this is in an election that was won by only 312 purported votes. In case you're saying this is just par for the course; there has always been election fraud to some degree or another, I want to remind you that Al Franken cast the 60th vote that overcame a Republican filibuster and resulted in Obamacare becoming law. So voter fraud does matter! Of course, there are those who say that voter fraud doesn't exist. It is just a pretense to engender Voter ID laws, which they claim disenfranchise the poor, the elderly and minorities (not to mention illegal aliens who aren't even citizens!) But there are increasing reports of people voting twice, voting in multiple states, and even voting after they are dead! But, oftentimes, with only a $50 fine and 3 hours of community service as their judgment, there's just not a whole lot of risk for those who are enticed to break the law. So I guess it should come as no surprise that monitors from the United Nations will now be looking over our shoulders as we exercise our American and Constitutional right to vote. The Organization for Security and Cooperation in Europe (OSCE), a U.N.-affiliated group, will be "looking for voter suppression activities by conservative groups, a concern raised by civil rights groups." Just who are these "civil rights groups" that are so concerned about the legitimacy of our election process? They are focusing on a number of areas on the state level, "including the legal system, election administration, the campaign, the campaign financing [and] new voting technologies used in the different states,” said OSCE spokeswoman Giovanna Maiola. The obvious question for me, as I'm sure it is for many of you, is how the hell did the United Nations gain jurisdiction and authority over our elections? 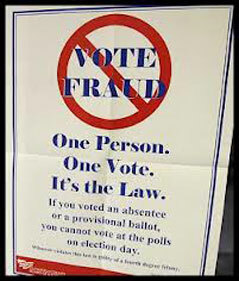 Why, if voter fraud is suspected (by anyone of either Party), would we not clean our own house? Eligibility to vote is determined by both the federal and state governments. I can easily see the Federal government giving access to U.N. monitors, but where are the States? Is the average legitimate voter aware that the U.N. is involved in our election process? Many independent and liberty-minded groups are standing up and monitoring the monitors. American volunteers will be standing alongside European observers from the U.N. Our Founding Fathers must be turning over in their graves! But maybe not. They were a lot wiser and more discerning than we are. It was Benjamin Franklin who said, "Democracy is two wolves and a lamb voting on what to have for lunch. Liberty is a well-armed lamb contesting the vote!" The civil rights groups, the U.N. and the European hirelings may think they represent Democracy and are looking for an easy lunch. But they underestimate just how much we Americans love our Liberty. We are just as interested in seeing that this election is not pilfered as the wolves who would steal it. We are still the United States of America, not a servant of the United Nations. Leviticus 19:11 "Do not steal. Do not lie. Do not deceive one another. "